From the Orkney Herald, 29 Aug 1928. On Friday, 24th August, the school picnic was held at the Bu’, on a field kindly granted by Mr Malcolm Ross. The weather was at its best, and therefore ideal for the purpose. The children were marshalled at the school at 2 p.m. Overjoyed with the half-holiday, and eagerly anticipating a good time in the afternoon, they presented a bright merry band as they marched in joyous spirits to the picnic ground, accompanied by their teachers and members of the committee, the oldest of them at the same time helping to carry some of the “necessaries” to the field. On their arrival there they were arranged in order and served with a liberal supply of milk and cakes. After a short interval the programme of sports was entered upon. These proved interesting and amusing, and were well contested. To begin with the various events were confined to the children, but as the afternoon wore on parents and friends gradually put in their appearance, until there was a large crowd assembled. The programme was then altered to admit of sports for adults and children alternately. Thus interest for all was maintained throughout a long and varied programme. The “bun” race was as amusing as ever, while the egg-and-spoon race proved that to run with real eggs would be a costly affair owing to the number of breakages that would inevitably take place. The great attraction of the afternoon, however, was undoubtedly the pillow fight. The bouts amongst the boys were enjoyed by the spectators and raised shouts of laughter. The competitions amongst the men were also well contested and kept the onlookers in happy mood, the bout between young Joe and Mac fairly captivating the crowd. At the boot race the men declared they had a grievance, because ladies threw the boots, which had to be taken off for the occasion, too far apart. However, they came up smiling again for the next contest. The two items, putting the stone and the high jump, were really well contested, the winner of the first event throwing the stone (nearly 18 lbs.) 23 feet 3½ ins., and the winner of the latter clearing 3ft. 11 ins. Some good running was also witnessed amongst the lady competitors. The last item of the sports programme was a sprint for all-comers, which was very well run. About 5 o’clock there was a short interval for tea for all. The children were handed out “baggies” of good things, and were delighted no doubt on finding some unexpected caramels and sweets extra in the bag. These were generously gifted by Miss Leslie. The older people had tea and cakes served out to them by the members of the committee. All appeared to enjoy the tea, and thereafter the games were continued to the end. Mr Robertson acted as starter throughout. Thus a happy and successful sports day came to an end. 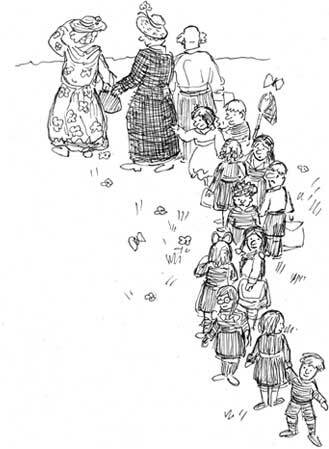 The arrangements for the picnic were under the charge of the teachers, assisted by Mrs Robertson, Schoolhouse; Misses Mary Simpon, Bu’; Bella Taylor, Orback; and Maggie Sutherland, Whanclett; and Messrs Joseph Simpson, Bu’; John Sutherland, Whanclett; and Thomas Sutherland, Standing Stones. Valuable assistance was also rendered by Mrs Joseph Simpson, Bu’, who kindly prepared the excellent tea which was served, and to her the committee extend their cordial thanks. Later in the evening a dance was held in the Templar’s Hall, which was well attended. The music was supplied by Messrs Robert Rosie, Saraquoy, and Wm. Work, Greenslide. Mr Peter Simpson discharged the duties of M.C. efficiently. Tea was served at a suitable interval, and was enjoyed by all. The dance was kept up to an early hour, and was very enjoyable. On the call of Mr Robertson a hearty vote of thanks was given to the musicians for so kindly obliging with the violin music. Similar votes of thanks were given to the M.C. and to the energetic committee. The singing of “Auld Lang Syne” brought a very happy evening to a close. Infants – 1 James Vigar, 2 John Ross, 3 Alex. Flett. Juniors – 1 Cecil Simpson and David Flett, 2 Herbert McBeath and Wm. Sutherland, 3 Ian Simpson and Eric Sutherland. Juniors – 1 Cecil Simpson, 2 Alfred Sutherland, 3 David Flett. 1 Sydney Barnett, 2 Tom Rosie, 3 David Flett. Juniors – 1 Cecil Simpson, 2 Wm. Sutherland, 3 Daniel Rosie. 1 John Barnett, 2 John Sutherland, 3 Tom Rosie. 7 years – 1 Dorothy Foulis, 2 Annie Sutherland, 3 Mary Sutherland. Juniors – 1 Jane Simpson and Dorothy Foulis, 2 Maggie McBeath and Lily Simpson, 3 Annie Sutherland and Maggie Flett. Juniors – 1 Mary Sutherland, 2 Margaret Simpson, 3 Thomasina Ross. 1 Nellie Rosie, 2 Mary Ross, 3 Clara Simpson. 1 Clara Simpson, 2 Barbara McBeath, 3 Nellie Rosie. Juniors – 1 Margaret Simpson, 2 Thomasina Ross, 3 Dorothy Isbister. Juniors – 1 Margaret Simpson, 2 Maggie McBeath, 3 Thomasina Ross. 1 Miss Maggie Sutherland and John Sutherland, 2 Miss Bella Taylor and Peter Simpson. 1 Ronald Barnett (3ft. 11 ins. ), 2 John Sutherland. 1 Ronald Barnett, 2 Peter Simpson. 1 Miss A. Baikie, 2 Miss Hope Sutherland. 1 Thomas Sutherland (23 ft. 3½ ins), 2 William Sabiston. 1 Mrs Robertson, 2 Mrs Harms. Men – 1 Peter Simpson, 2 Thomas Flett. Men – 1 Albert Flett, 2 James Sutherland. 1 Roland Barnett, 2 Alex. Isbister. 1 Peter Simpson, 2 Joe Simpson. Men – 1 Roland Barnett, 2 Malcolm Ross. 1 Roland Barnett, 2 Thos. Flett. 1 Miss A. Baikie, 2 Miss Mary Simpson. Thanks to Shelagh and Bob Stirling for digging this one out of the Kirkwall Archives.